Habitat : It is a deciduous subshrub of southeastern asia. Product offered : Leaf, Leaf Powder, Roots, leaves. Uses : The Indigo Leaves are used to make hair dye as well as prepare medicated hair oil. Leaf powder is used as natural black color dye for hair. 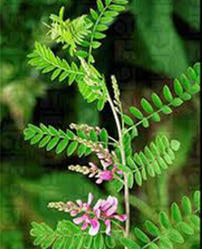 Indigofera make your hair more manageable, moisturized, protected with radiant shine. Dye is obtained from the processing of the plant's leaves, Indigo is among the oldest dyes to be used for textile dyeing and printing. The root is crushed and prepared into decoction, and given for abdominal disorders,leucorrhoea, all types of toxicities etc. The leaves are crushed, prepared into decoction and given for toxicities,fever,arthritis etc. The leaf juice is given in the dose of 10-20ml along with honey twice daily for jaundice, inflammation of liver etc. For poisonous bites the samoolam or the whole plant is ground and applied as a paste over the bitten area. Also the leaf juice is given internally to the patient.